A twelve year old girl spends her summer at Fowey with her aunty and uncle. She's always been a little different, obsessed with murder cases. So one day when a body is washed up on shore, she is overly excited. 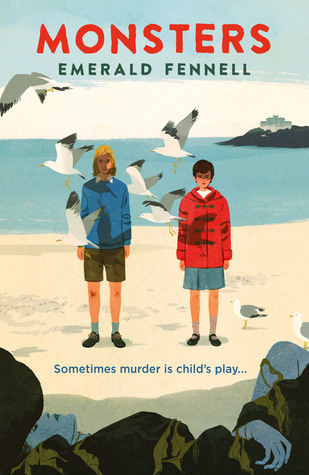 Then she meets Miles, a twelve year old who shares the same interest in murders that she does. They begin to investigate the murder, questioning town members and digging for their own clues. But there's no better way to understand these killings unless you re-enact it ... right? If you think you know what Monsters will be about, think again. I was extremely surprised at how far off my prediction of this story actually turned out to be. Monsters follows two 12 year olds and their adventures on a summer holiday. Except I would never recommend this to any young children to read. This is by far one of the creepiest reads I've come across in awhile, only because it is very disturb. I was engrossed in the story because I kept wanting to know more. But I didn't realise that I was being pulled into this small town and their seemingly perfect lives. I liked that as soon as I started reading, I felt like I was part of the town and was getting to know everyone and everything about the place. The more I read, the more secrets were revealed - about the town, its people, and its history. It made for a believable plot amongst all the intrigue and creepy events. The characters were all unlikable, written with undesirable traits. I felt some sympathy towards the main character, who had no name, but it was her friend who irritated me. I suppose though that they written in a way to convey some sort of message. All the characters though, portray some type of effect from traumatic experiences, which adds to the depth of the story. Rarely are mental disorders of any kind addressed in novels, so I like that Fennell has introduced this aspect into Monsters. I also love how she went about it. Fennell writes about these traumatic effects in a subtle way so that I was left thinking about the disorders and the consequences it had on the characters. It's not thrown in your face and saying "pay attention to me, I'm important as well," but is noticeable enough to actually bring out a response from me. Overall, the story gave me a lot to think about. I definitely did think the grotesque/dark humour went too far sometimes. However, the general feel of the novel was intriguing and entertaining. I don't think the ending was satisfactory - in fact if I could I would change that. Monsters was surprising and very dark, but I think it makes for a somewhat fascinating read. Do You Like Creepy Reads? Disclaimer: I was sent a copy of this book upon request from The Five Mile Press for review. This does not influence my view on this book.